We’ll discover how the architecture results in a clear application structure, how navigation is handled, how to use staged rollouts, how to test everything and even look at a production app that is using this architecture. All source code for this blog post is available on Github. This is not a fully functional app, but rather a highly focussed example that only concentrates on demonstrating the modularization architecture. One of the key benefits of the three-layer app-features-libraries architecture is supposed to be clear navigation throughout the app and source code. So let’s investigate if that promise holds true. There is one app that consists out of three features: dashboard, login, and sharing. It is backed by a few libraries: actions and ui-components. All feature and library modules are grouped within the features and libraries folder respectively. But what do the features themselves do? Clearly, this app seems to be about photos! But the navigation graph looks a bit odd (no destinations), this is because this isn’t an actual functioning graph! The navigation components don’t support visualizing a graph for an activity with bottom tabs (yet?). Here we go, the main dashboard consists out of three tabs: photos, albums and social. In one visual overview you can see that the login screen consists out of three screens that link together as a flow. The navigation graph even displays the nave of every screen on top so you can easily navigate to it! Again, a picture says more than a 1000 lines of code! Due to the way feature modules are defined, this architecture splits your app hierarchically, similar to how a user navigates through your app. This in combination with a visual represenation of each feature (navigation graph) helps to understand the app structure, the navigation between screens and find back the name of screens. All navigation within a feature is handled by the navigation components. To do this, just add a NavHostFragment to the Activity layout and load it with a navigation graph. Note how the fragment attribute instantiates a NavHostFragment that gets loaded with the navigation graph from login_graph.xml. This navigation graph doesn’t only describe the three screens that are in the login feature, but it also defines actions for navigation between screens. AvatarFragment, on the other end, is the last screen from where navigation is triggered to a different feature. Recall that features are full screen (entry point is an Activity) and different features aren’t allowed to rely on each other. Finally, relying on implicit Intents can cause chooser dialogs to pop up. While a collision with a 3rd party app is unlikely, it can easily happen for different build flavors. As you probably already know, I don’t believe in-app rewrites. However, refactoring by itself can also be frustrating and take a long time to provide results. So how do you get your app in better shape? Wouldn’t it be nice if you could aggressively refactor or even rewrite parts of your app without having to worry about a risky release? With the right analytics in place and a remote feature toggle framework such as Firebase remote config, you can now gradually roll out the rewrite. This allows you to build up confidence in the new code, mitigate risks of breaking a crucial user flow (e.g. Login) and hence refactor/rewrite parts of your app way more aggressively. First of all, unit tests should be added for all business logic: both for logic internal to the feature modules as for all business logic of libraries. The app module likely doesn’t require any unit tests as there is no business logic in that module. Next, all features can be tested using Espresso in isolation from the rest of the app! No need to step from the start screen throughout the entire app towards the screen you want to test first. 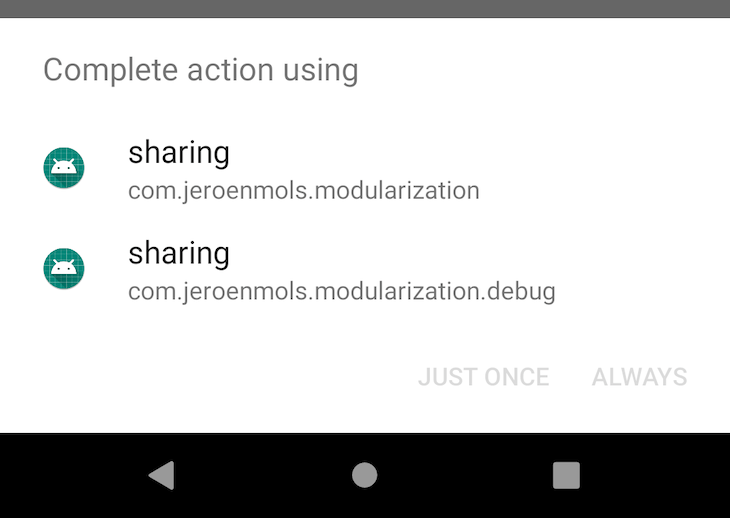 Just start the feature activity directly via an ActivityTestRule. Such feature tests are fast, way more reliable (can’t fail due to bugs in other features) and don’t require much setup. With all business logic unit tested and features tested in isolation, the missing link is to test “real world app usage” in terms of long, typical user flows. The app module tests will be the most difficult ones to write and stabilize, but due to the split in feature modules, the largest chunk of tests can run in isolation per feature. So this provides a really nice balance between reducing repetitive manual testing, while keeping development/maintenance cost under control. While this architecture sounds good in theory and the example looks nice on paper, it still isn’t a full fidelity app. Are you sure this will actually work in production? All features are independent, self-contained and they don’t rely on each other. There is only one single app module. 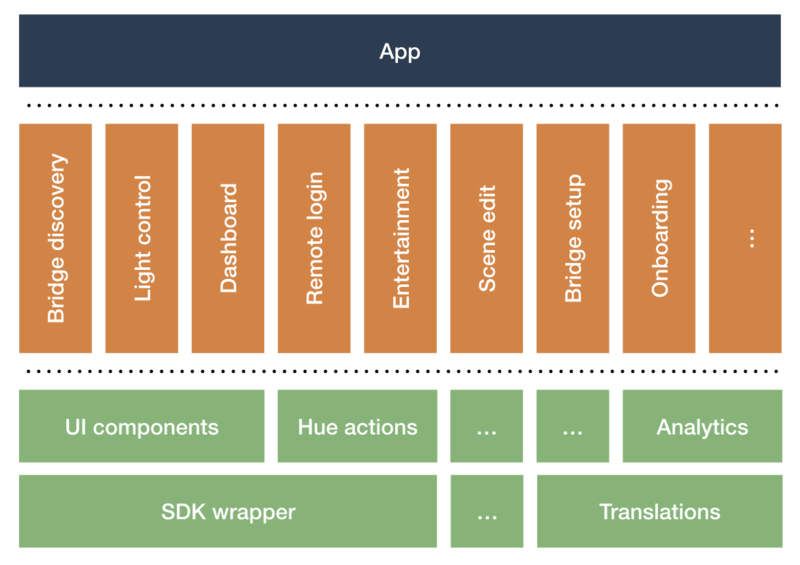 Note that due to the large legacy code base of Philips Hue, it hasn’t fully migrated to this architecture yet: currently, there are 8 feature modules and 14 libraries. Rewriting features with a feature toggle and gradually rolling them out happens on a regular basis. Translations: ideally each feature should contain its own translations, but for Philips Hue, this would require to dynamically split the monolithic translation files from our translation agency for each feature. Simply not the biggest fish to fry at the moment. The three-layer app-features-libraries architecture addresses quite some fundamental app/modularization issues: project structure, navigation, staged rollouts and testability. 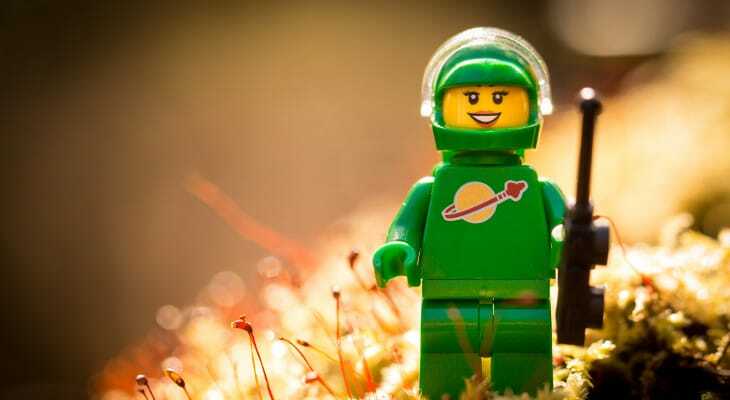 Next blog post, we’ll investigate how you can start modularizing an existing app. Make sure to follow me on Twitter so you don’t miss it!